Windfall is the boldest profile of the world's energy resources since Daniel Yergin's The Quest. Harvard professor and former Washington policymaker Meghan L. O'Sullivan reveals how fears of energy scarcity have given way to the reality of energy abundance. This abundance is transforming the geo-political order and boosting American power. 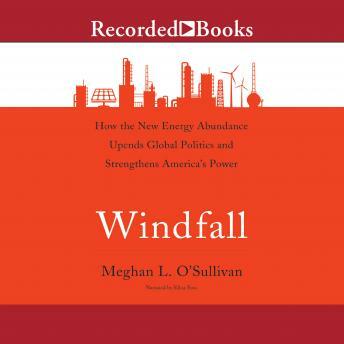 As a new administration focuses on raising American energy production, O'Sullivan's Windfall describes how new energy realities have profoundly affected the world of international relations and security. New technologies led to oversupplied oil markets and an emerging natural gas glut. This did more than drive down prices. It changed the structure of markets and altered the way many countries wield power and influence. America's new energy prowess has global implications. It transforms politics in Russia, Europe, China, and the Middle East. O'Sullivan explains the consequences for each region's domestic stability as energy abundance upends traditional partnerships, creates opportunities for cooperation. The advantages of this new abundance are greater than its downside for the US: it strengthens American hard and soft power. This powerful book describes how new energy realities creates a strategic environment to America's advantage. Author bio: Meghan L. O'Sullivan is the Jeane Kirkpatrick Professor of the Practice of International Affairs at Harvard University's Kennedy School of Government. She is also the Director of the Geopolitics of Energy Project, which explores the complex interaction between energy markets and international politics. Between 2004 and 2007, she was special assistant to President George W. Bush and Deputy National Security Advisor for Iraq and Afghanistan for the last two years of her tenure. She lives in Cambridge, Massachusetts. Windfall: The New Energy Abundance Upends Global Politics is her third book.